You guys are looking at the curry of summer!!! 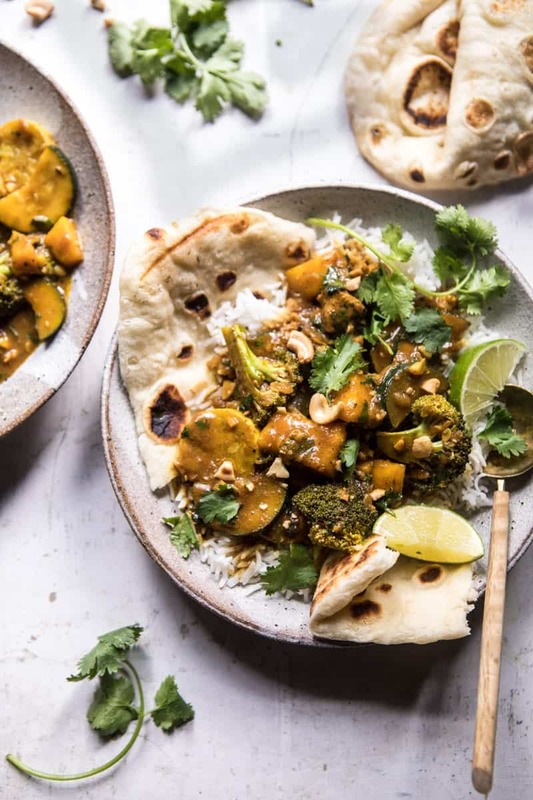 This simple coconut mango chicken and broccoli curry is everything. 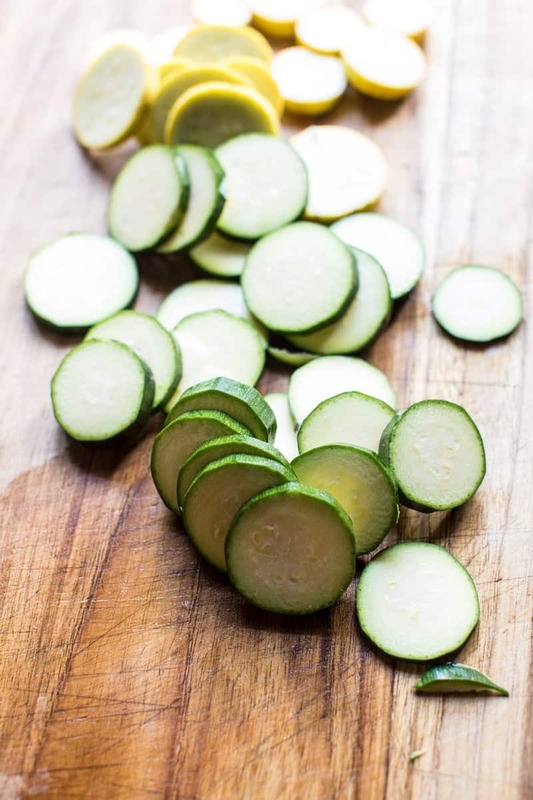 It’s easy, healthy, packed with some of everyone’s favorite summer veggies (hello zucchini and summer squash, I’m talking about you!) and finished with fresh mango (which if you guys could not tell I am pretty much obsessed with this summer). All served over rice with a giant piece of fresh naan for scooping. Let me just say that I don’t think curries are the prettiest food ever, but they are delicious. You know how the internet can make things seem like everything is perfect? Well, I’m here to tell you it’s totally not perfect. At least not around here. 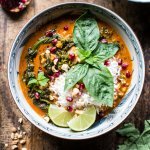 I had the hardest time photographing this curry, it’s just not as pretty as most foods. The photographs pretty much just took it outta me and I reshot this dish three times before I called it quits and said the last set of photos was IT. I finally decided that even though I strive for perfection, I am not perfect and never will be. I tried to console myself with the old saying that sometimes it’s the imperfections that are most beautiful. I think I need to say this five times over in my own head…and then, maybe, it will stick. Anyway, this rambling is more or less a pep talk for myself, but I’m hoping it may help at least one of you. I know I’m not the only one who struggles with self-doubt and the desire to always have your work be perfect. OKAYYY. Pep talk over on to the food! If you guys remember, I said in Sunday’s post that I’ve really been craving Indian food. For some reason I always think of Indian food as more of a fall thing. I think it’s because of the cozy spices and creamy sauces. 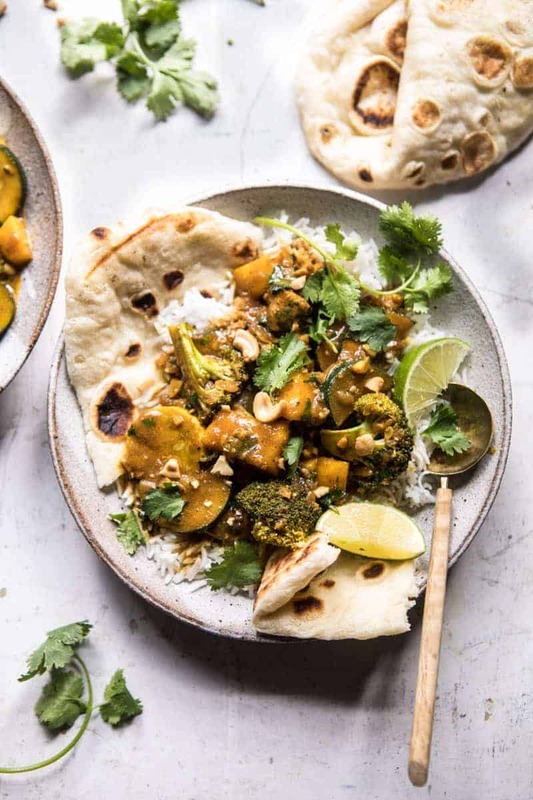 I really wanted to make a summery Indian inspired recipe that was both cozy and light, and of course filled with summer produce. 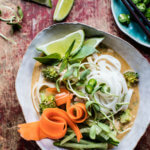 Enter this coconut chicken curry. 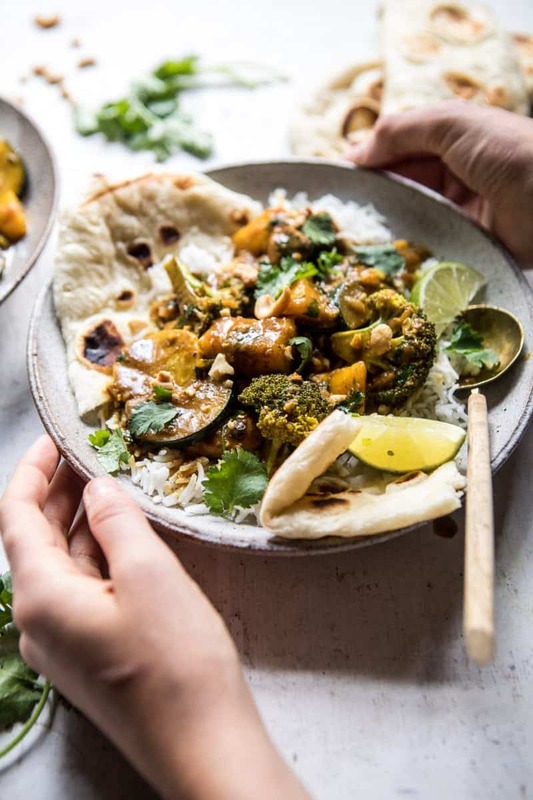 It’s light and summery, but yet still cozy with its creamy coconut sauce and giant side of rice…plus fresh naan (you must have the naan, it’s honestly the best). I made this recipe as soon as I returned home from Mexico, as I was really just in the mood for comfort food, and this was the perfect solution. The entire recipe is made in ONE pan and in just about thirty minutes. 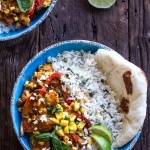 Simply cook the chicken and veggies together with curry powder, garlic, and ginger, add some coconut milk, simmer a bit, and then stir in the mango just before serving, so it doesn’t turn to mush. So simple and fast, but also so incredibly flavorful. I used a mix of zucchini, summer squash and broccoli for my veggies and loved the combo. Something about the broccoli and squash together just works so nicely. You can of course use any mix of veggies you’d like. Bell peppers and eggplant would be extra delicious in this as well. For this curry, I stayed clear of any tomatoes, as I didn’t want those flavors to compete with the mango…although I’m sure it would have been fine. Personally, I just LOVE a lot of mango flavor. Also, of you are a cilantro hater, swap in basil. I’ll never understand how some people hate cilantro, but you either love it or hate it. Obviously, I’m a lover. Double also, I know I mentioned this, but the naan is truly a must. To be honest, it’s one of the reasons I make curries in the first place. 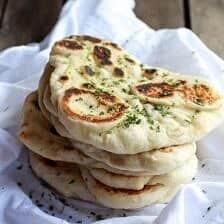 Naan is just made for scooping up a nice saucy curry. <–FACT. 1. Melt the ghee in a large skillet over medium heat. Add the onion and season with salt. Cook, stirring occasionally until the onion is golden, about 5-8 minutes. 2. Add the chicken, curry powder, cayenne and a pinch each of salt and pepper. Cook 5 minutes or until the chicken is browned. Add the garlic add ginger and cook another minute. Add the zucchini and summer squash and cook 2 minutes more. Pour in the coconut milk and add the broccoli. Bring the curry to a simmer and cook for 10 minutes or until the sauce has thickened slightly and the broccoli is tender. 3. Remove from the heat and stir in the cilantro, mango, lime juice and zest. Serve the curry over a bed of rice with fresh naan. Top with cashews. Enjoy! Lastly, a little goat cheese on top would be extra YUM…just sayin’. Awh thats awesome!! Thanks so much Seda! I agree with Julia! You take beautiful photos for EVERY.SINGLE.POST!!! *wants to grow up to be like you* annnnndddd i am now hungry for this summer curry! OMG, Tieghan, what are you talking about?! These photos are AMAZING, STUNNING and BREATH TAKING! As always, by the way. Everytime you ramble about how you hate your pictures, I am shaking my head in disbelief. I cannot see any flaws so stay cool. Aaanyway, not only this looks great, it certainly tastes ever better (if it is possible). 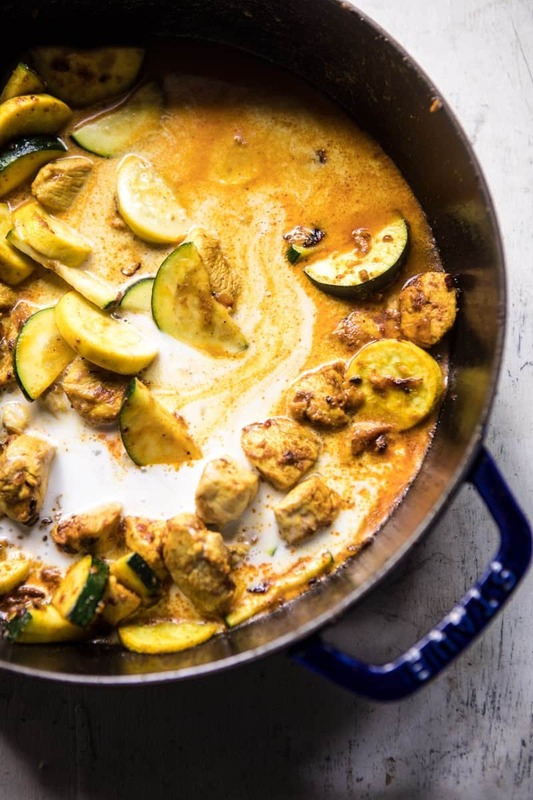 I’m dying to try this, becasue: a) I love zucchini; b) love coconut milk; c) love curry; d) love mango. So this is the most awesome combination ever. Thank you for the recipe and have a nice day! AWh thank you so so much!! Really really nice hearing you like them! Wow!! And you made it, yay!! SO SO happy you like it Jar! Weirdly enough I find it kind of encouraging when you are critical of your photography because you take without a doubt THE most beautiful food photography I have ever seen! Gives me perspective when I’m down on my own work, maybe it’s not as bad as I think either 🙂 Anyway, this looks amazing! Very interesting look at it but totally makes sense!! I like that way!! Thanks so much Penina! The pictures are spot on as always, absolutely no worries! I remember last week you asked for some Indian food recipe ideas – have you ever tried chickpea chana masala? My Indian roommate makes it all the time and it’s amazing. Thank yoU!! I have never made chickpea chana masala, but it sounds delicious! 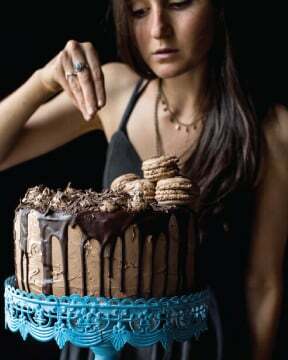 This is now on my recipe list! Thanks again! Love. A. Curry! NOM!! As for the photos – I dunno what you’re talking about lady – they look great! The pictures are beautiful as always!!!!! 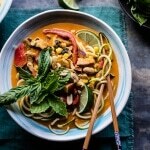 I’m the number #1 fan of curry and this dish look delicious! Had a feeling you would love this one! Thanks Carlos! Tieghan, can you do a video on how to dice a mango? I don’t know how to do it without ending with a pile of mush, which still tastes fine but doesn’t look the best! 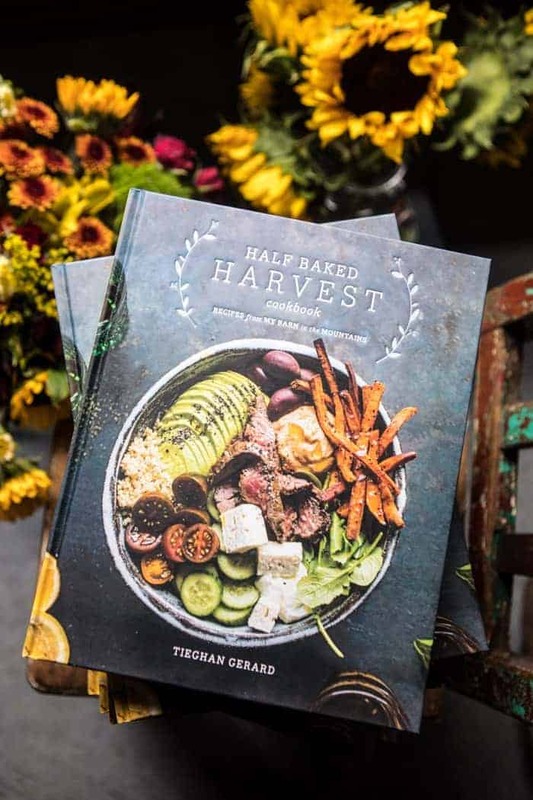 Tieghan, I love reading your blog! I just found my new quote of the day/inspiring mantra: “Sometimes it’s the imperfections that are most beautiful.” Thank you for sharing! It’s hard to believe you found difficulty photographing this dish! It’s so comforting to be reminded that we can’t always be perfect. 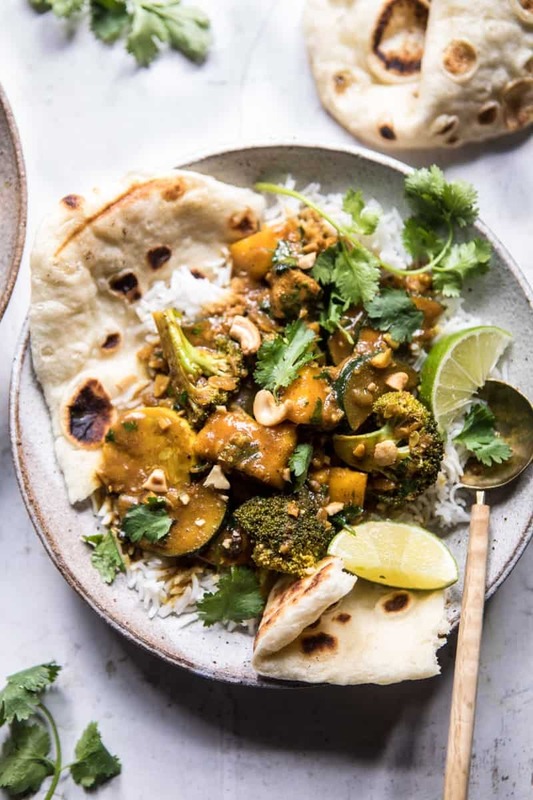 I’ve always been scared of making curries for some reason (I don’t know, they just intimidate me), but this one looks too good to pass up! Wow, I love that quote!! Makes me feel a lot better about photos and my food!! 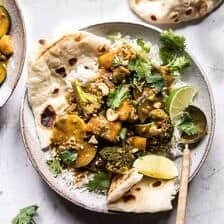 You totally can make this curry!! Oh well that’s just going on Pinterest immediately! 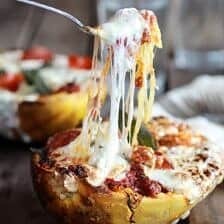 I love tasty recipes like this that my fiance will actually eat! Ah your so right all I want is perfection! Its hard to settle on photos! I’m sure everyone has similar issues! I made this last night and it was really quick and easy to pull together! Also, it was super delicious and filling without feeling heavy. I am usually skeptical that curry recipes may be bland (those curry paste jars are always disappointing), but I was surprised at how flavorful it was (though I was generous with the cayenne). So happy you made it and liked it!! They can be bland for sure!! But I’m so happy mine wasn’t (: The cayenne does always help! Just made it! Just ate it! Have leftovers! Yay! So delicious! Haha, yay! Happy you like it, thanks Julie! Made this tonight- absolutely delish! And the lime juice & zest and mango really took it to a new summery level. Wound up eating the rest of my bag of cashews I picked up at WF before and after cooking tonight! Thanks Tieghan for all of the continued ‘YUM’❤️….xoxoxo. So so happy you loved this Gia! … and I totally do the same with cashews. They’re too good!! Thanks so much! I am a late commenter b/c this is how long it took me to align all the ingredients & have the time to cook it! 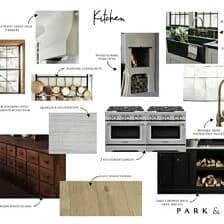 As much as I am myself a huge fan of your adorable blog & inspired & inspiring recipes, it is so much more helpful to other readers to report one’s experience & reaction to a recipe. Maybe that is a review? I wish there were a section for that kind of comment. We could still rave about the fotos. As for the recipe, yes yum! The only changes I made were subbing a fresh minced jalapeno for the cayenne & sweet potatoes for the summer squash. Added chopped fresh white peach on top; we had no cashews. We had it over Khao Deng ruby rice; very pretty! TY so much for your care–every recipe I have tried of yours has been successful. This 1 is also a winner! Hi Susan! So so glad you loved this recipe and the substitutions sound great as well! Thank you! 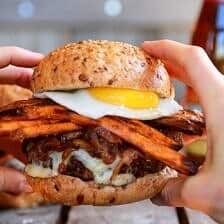 This is my first time on your website as a referral from my sister making this recipe this evening! The first thing I said out loud when I saw your thumbnail photo and then the full size photo is “That is beautiful!” I personally thought your presentation was amazing. It made me want the food, my mouth water and also made me note out loud how amazing the naan looked! Well done !!! Thank you so so much Crystal! So happy the whole family liked it!! Thanks Lynn! Joanne! I am so glad you still enjoyed this recipe. I hope it turns out better for you the next time without the zucchini! Thank you!